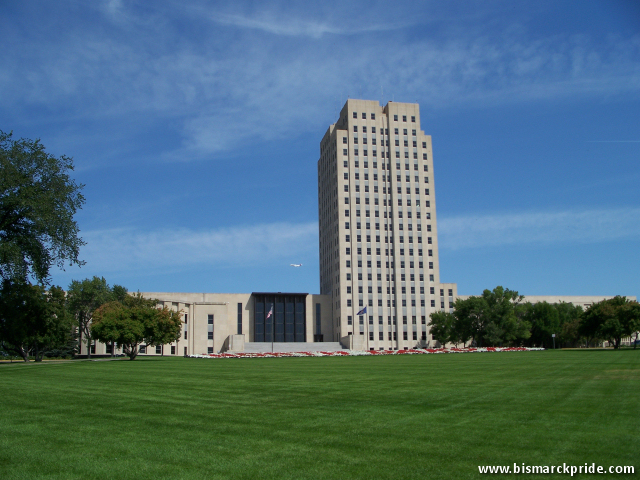 The North Dakota State Capitol is located at 600 East Boulevard Avenue in Bismarck. Nicknamed “Skyscraper on the Prairie”, the capitol stands nineteen stories tall with separate legislative and judicial wings attached to the tower. The current capitol building was completed in 1934 as a replacement to the former capitol that burned down on December 28, 1930. In 1883, the Dakota Territory legislature approved the relocation of the capital from Yankton to Bismarck, necessitating the completion of a new capitol building. The cornerstone was laid on September 5, 1883, with first occupancy at the end of 1884, just in time for the 1885 legislative assembly. Architect Buffington of Minneapolis designed the capitol and more than 4,000 people were involved in the capitol’s construction. Excavation commenced on August 17, 1883. By January 20, 1883, 4,000 bricks made of Joliet stone and terra cotta had been laid – in cement – and iron work was completed. The capitol was erected at the center of the 160 acres Bismarck was required to donate for the site. Two stories of it were built during the winter, requiring bricklayers to maintain a sheet iron stove to keep the mortar from freezing. The building was among the first, if not the first, in the territory to be lit by electricity. It contained more than four miles of steam pipe and five tons of carpet. Initially, only the capitol’s core – referred to as the tower – was completed. The tower was 92 feet by 153 feet with three stories plus a 12-foot high basement. The exterior shell of an east and west wing was also finished to give the appearance of a completed building, but these sections were not finished until additional space was later required. When North Dakota officially became a state in 1889, the building continued to house the government offices of the state. Fire consumed the capitol on December 28, 1930. Its cause was later discovered to have been from spontaneous combustion by a collection of rags covered with turpentine and varnish that were used to prepare for the upcoming legislative assembly. Insurance only covered $728,000 in damages, however the loss was in millions. Many important state documents were also destroyed in the fire, including all but one copy of the state constitution, rescued by a bold individual. North Dakota was forced to build a new capitol in the midst of the Great Depression. To keep costs low, the state chose to construct a 19-story art-deco style skyscraper at a cost of about $2 million. Ground was broken on August 13, 1932. Construction of the new capitol was not without problems. On May 16, 1933, construction workers went on strike for betting working conditions and a pay increase to 50 cents per hour. The strike lasted for weeks and resulted in several arrests and injuries. Governor Langer declared martial law on June 1 to settle the strike. The capitol was finally completed in 1934, however was bittersweet as the North Dakota government was facing another major crisis with the removal of Governor Langer from office following a felony conviction for fraud on June 16. Langer’s removal did not go smoothly, however with the backing of the United States senate, the transition from Langer to Governor Olson eventually took place. The new capitol was expected to have plenty of room to house the state government offices, however the space quickly filled up. The government purchased the building that housed Bismarck Junior College and converted it to additional office space. In 1981, construction was completed for the Judicial Wing attached to the eastern portion of the tower. Used for many community events, the Capitol Grounds feature walking paths, two parks, various species of trees, a veterans memorial, and various statues that includes one of Sakakawea. The capitol grounds were used twice to break the world record for the most snow angels, most recently in 2007 with 8,962 people participating. The capitol itself is often used for seasonal displays. During the holiday season, alternating window shades of red and green are closed to form a Christmas tree, and at the end of the year, the windows are used to display the upcoming year by lighting the rooms to form the numbers. To see a list of other buildings and objects located adjacent to the State Capitol, visit the State Capitol Grounds page.